I spent my birthday weekend in Moab, Utah. Now, I will state for the record that Moab isn't exactly the 'it' place to visit, but I had my reasons for going. 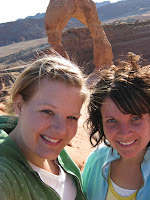 One of the reasons was to hike to the Delicate Arch. Meags and I asked a man to take our picture and for some reason, he only captured a small portion of the Arch so we took matters into our own hands and took a picture of ourselves. Some friends came over for a Wii party and I sang my little heart out while singing for the American Idol game. Simon Cowell told me I could sing the phone book and it would sound amazing-definitely a highlight of the night. There were too many pictures to choose from so I made a slide show from the Wii Party and birthday dinner. Enjoy! Happy late Bday Shelley! Sorry I missed it. Looks like you had some good times. You look beautiful!